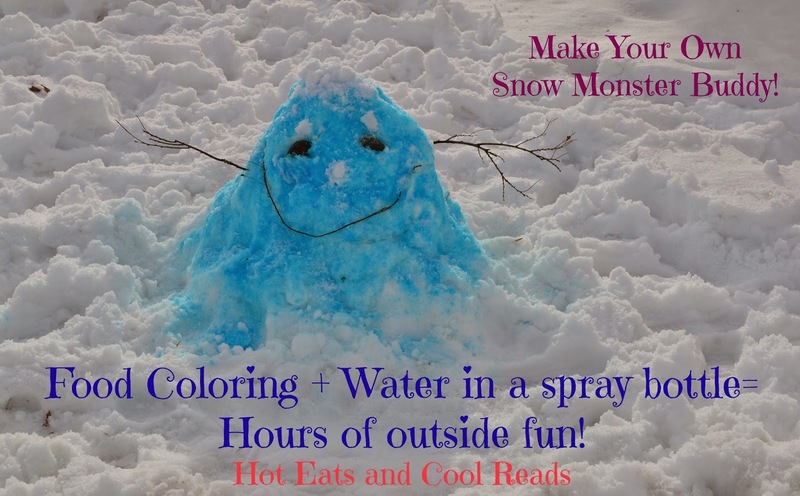 Hot Eats and Cool Reads: Fun Outside... Make Your Own Snow Monster Buddy! Fun Outside... Make Your Own Snow Monster Buddy! I have a fun outside activity for the kids today. Not a recipe post, but it does use food ingredients! My daughter and I made a Snow Monster Buddy today. The weather here in Minnesota is beautiful after a long stretch of brutal cold. We had to get outside and do something. My brother and I use to color the snow all the time when we were little, and it was a much fun for my daughter as it was for us! Use your imagination and make different shaped monsters, dinosaurs and add other accents instead of rocks and sticks. The possibilities are endless!! Mix the food coloring and water in a water bottle. Be very generous with the food coloring, you want the water mixture to be pretty dark in order for it to show up on the snow! This is such a cute idea. I wish that we got a enough snow to try it out, but I'm pinning it, just in case! We don't get much for snow here in Phoenix - but this is such a cool idea, I almost wish we would get just enough snow so my kiddos could do this :) Pinned! Fun! Fun! What a great and simple idea!